We are all out to pasture, and my grass turns brown sometimes;And over on your side does too. 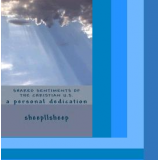 An edited collection of selected and new poems, SHARED SENTIMENTS OF THE CHRISTIAN U.S.... is an inspired work that embraces words from the little known, Raven Freemont Boyd (RHYME AND REASON 1958). This new edition of Mr. Boyd's forgotten writings gently intertwines his words with a few others, to now be established into the 21st century. SHARED SENTIMENTS OF THE CHRISTIAN U.S.... reflects some of the Christian's convictions concerning life as an American, while also: reaffirming the patriotic, moving the compassionate, invoking the faithful, enlightening the wise -and should stir us all! A Special Thanks To Mr. Raven Freemont Boyd May Your Silenced Words, Now Be Heard!